That's what the weather guy called them. despite the 20 something temperature. On the stereo, Eileen Ivers An Nollaig. beautiful arrangement with the paperwhites and tangerines. Gorgeous photos! What I would do to see snow. Enjoy! 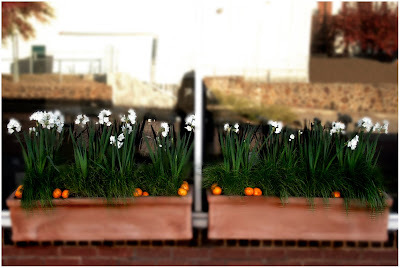 paperwhites and tangerines! just couldn't be more holidayish! I still can't believe that all of my TX friends and family, who live everywhere from Amarillo to San Antonio, have experienced snow before me this year. This is a beautiful photo. I love the contrast of colors. tee hee, snow fluffies, my little one is hoping and hoping. Snow fluffies! I love that! Paperwhites look like spring bulbs!